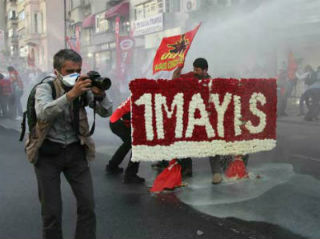 Once again, our Turkish comrades are asking for our help. Berlin conference: We’re now just 4 weeks away from the conference opening on Friday, 23 May. The number of people registered since I last reported 4 weeks ago has gone up by 85 — we now have 579 registrants. It is very likely that this will pass 600 in the next week. The majority of registrants (300) come from just 11 countries — Germany (129), the UK (61), USA (20), Russia (18), Canada (16), the Netherlands (15), Switzerland (12), and Ukraine (11). There are 17 coming from three Nordic countries. More than 30% of all registrants in the last month came from Germany. There are some large delegations registered from developing countries, though we’re not certain how many of these people will actually be able to attend. These include: Nigeria (31), Liberia (25), Bangladesh (20), Pakistan (20), and Cameroon (17). In total, we have delegations registered from 70 countries. The 61 coming from the UK is larger than the total number of participants in our London conference in 2008, and the 36 coming from North America probably exceeds the total number who attended our Washington conference in 2009. LabourStart will have a stall at the ITUC World Congress which is happening in Berlin just before our event. In addition, a number of LabourStart correspondents will be attending the ITUC as journalists. 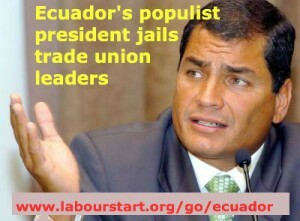 If you can be at the ITUC event, please let me know. We’ll need help staffing that stall and raising LabourStart’s profile there in general. Publicity: We now have a global media list with over 200 addresses on it. We’ve now sent out our first three press releases to that list. If you have any suggestions for journalists who should be added to the list, please send them on. We’ve now prepared a new LabourStart flyer which will be published initially in English, German and Russian. Thanks to Gisela and Derek who helped write the text and to Masha who did the graphic design. If you’re coming to Berlin, please make sure to leave room in your luggage to take copies of the flyer home with you. For the second time, LabourStart is a sponsor of the London Labour Film Festival which takes place next week. We have a large ad in the festival programme, and we did two mailings to our UK list urging people to attend. Books: We’re nearly ready with Book 4 (Dan Gallin) — this will be ready for sale at the book launch in Berlin. 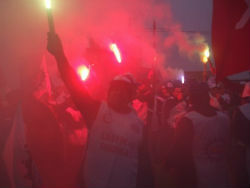 Campaigns: We’ve launched just two new campaigns in the last six weeks — supporting Georg Fischer workers in Turkey and union leaders sentenced to jail in Ecuador, launched this week. Both campaigns are growing well and quickly. We closed down the Crown Holdings (Canada) campaign after some 4 months online. We are keeping a couple of older campaigns going at the request of their initiators — Aeroflot and Cambodia. Both have very large numbers of supporters (+12K). In addition, we’ve helped give extensive publicity to campaigns launched by our friends. We just did a mass mailing yesterday to support the IUF campaign for North Carolina tobacco workers. We also gave extensive publicity to the Amnesty International campaign in support of jailed union leaders in Bahrain. Finally, we launched a Canada-only campaign last month — also in support of the Crown Holdings workers, but targetting the premier of Ontario. 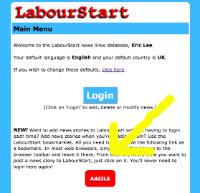 News: As I reported earlier this month, there’s now a new, quick way for correspondents to add news links to LabourStart. The number of active correspondents has grown; in mid-March we only had 76 actives and today that number is 92. We need to continue working to ensure that many more LabourStart correspondents post news regularly. Fundraising: April is one of the months that we tend to do a fundraising appeal and our totals this time were disappointing. The total donations for this month are nearly £6,400 — more than £1,000 less than the average we get for the months we do such appeals (though considerably better than we did in July 2013). I discussed these issues in a post below, and have decided to move toward annual, rather than quarterly, appeals. In addition to that money, we have received a pledge of yet another donation from Unite Here (in the USA). And we’ve received substantial support from German trade unions and foundations for our Berlin conference. Finally, we don’t appear to have won any of the three competitions we were entered into (see my post from 19 March). Darn. Please spread the word in your union and to your networks. Thanks. People have been asking for something like this for a very long time. Today I finally wrote the code to do it. Login to post news as you normally would. On the second screen, the one that’s entitled “Main Menu”, look at the text highlighted to the left. The yellow arrow is pointing at it. Leave it there — it will say “Add2LS”. Now, go visit a website that’s a source of labour news. Find a news story you want to put on LabourStart. Click on the “Add2LS” link in your toolbar. And magic — you can begin adding the news story. The link sits there permanently in your toolbar, and you never have to login again. News stories always appear in one window (or tab) and the form in another so that you can glance back at the news story for stuff like the name of the publication, the title, and so on. This should make it easier and quicker than ever for correspondents to post news stories. Try it and let me know what you think — and how it can be improved. There have been huge increases to our Japanese, Portuguese, Arabic and Korean mailing lists — as high as a 27% gain for the Japanese list. The German list continues to grow, and has replaced Italian as our 5th largest list. We saw growth in traffic to both our websites (the news and campaigning sites), with a doubling of traffic to the latter (due to new campaigns being launched in March). For the first time we’re seeing Morocco appearing in the top 10 countries bringing traffic to LabourStart — this is no doubt due to our campaign on behalf of the “Casablanca 5”. In this report for the first time I provide data on which operating systems people are using to access LabourStart. It will be interesting to compare this month on month. Interesting to note that almost one in five users of our campaigns does so through a smartphone or tablet, with only about 80% still doing this through desktop and laptop computers. The launch of our website for small screen devices couldn’t have come at a better time. I’ve had a discussion with some of the senior correspondents and have also triggered a discussion on the e-Campaigning Forum mailing list, have learned a few things, and wanted to share some thoughts. First of all, our current quarterly fundraising campaign is going poorly. We’ve raised just £1,534 even though we’ve mailed to our English, Spanish, Dutch, Norwegian, Danish, Hebrew, German, Hungarian and Indonesian lists. Our message therefore has reached 100,045 people who have donated an average of 1.5 pence (£0.015) per person. This has to be understood in the context of what are actually rising donations to LabourStart — we’re up 30% compared to where we stood two years ago. Many of those donations are from unions — local, national and global unions. But we need to take some steps to improve our ability to raise money from the individuals who support our campaigns and who are on our mailing lists. First, I will now return to an annual appeal for funds rather than a quarterly appeal. That way, people will be getting 20 or more campaign messages from us over the course of a year before they hear from us asking for money. Second, based on the extraordinary success story of Greenpeace UK, I will embed a much more prominent and clearly branded donation form on the “landing page” people see when they sign up to a campaign. Apparently, the best time to ask people for donations is when they’re actually supporting a live campaign.